A family of four is pondering its next steps in their life, many of them intertwined with their household finance issues. With both parents working full time, they are on schedule to be completely debt-free in two years. But with two small children in preschool, the mother desperately wants to cut back hours and stay home with her kids during these precious years. With over $30,000 in debt and a tight budget, it is a difficult proposition. The struggle to becoming a stay at home mom (or dad) is real. If she reduced her 40-hour work week to 10 hours, they could swing it. Their budget would be tight and they wouldn’t be able to make any significant progress on their debts, but they could make it without any daycare necessary. She could learn how to meal plan, set a budget, and even make more money at home. What price does one put on spending time with children in their early years? Is it even possible to assign a dollar amount to something like that? But due to financial pressures or lifestyle choices, many forgo this special time in order to better their current and future economic situation. In the scenario above, there is no right answer. Spending more time with your kids now means a delay of basically everything money-related: getting out of debt, saving for an emergency fund, retirement, college funds etc., all go on the back burner for a few years. And there is no guarantee that the mother would be able to go back to work full-time once the children are in school. While that is certainly a steep price, millions would say it’s worth it. Think of the shared memories created with children this age. Think of the greater parental influence you might have – will it carry over into their later years? Who knows? In the grand scheme of life, these memories might mean having to work three more years before you retire, maybe more. Amidst all the great financial advice and articles out there, remember that you have a life to live. Why do we work? Why do we make money? Why do we give to the needy? Why do we want to retire? Why do we want security? These questions cut to the heart of life… and they underscore the role that work and money play in our everyday lives. When mapping out your financial future, your end goal isn’t simply a ton of money; it is the comfort, security and whatever makes you happy. Money is only a means to that end. But here’s the rub – you’re living right NOW. Anyone could conceivably work 16 hours a day, live in a tiny apartment for years and never start a family. If you did this right out of college, you could probably retire at age 35 and never have to work another day. But what’s the point? Would you even be living life? Hardly anyone would do this. What do people say now – YOLO? You only live once. It alludes to an impending impulsive decision, but it boils down to the fact that each of us has only one life to live. This hits at the crux of what we are passionate about and why Lauren started this website. The intersection of life and money (the two haven’t always been intertwined) it’s more the recognition of this relationship that we are passionate about. It’s funny, the more I write finance articles and create financial tools like The Financial Renovation and The Personal Finance Planner, the more I come to realize that financial blogging is really ‘life blogging.” The whole point of becoming financially independent is the ability to live your life freely, without sacrificing your values. Back to the original scenario – imagine that couple could go back in time and tell their former selves of this difficult “future” dilemma? What would they say? February 2007 – we had finally come to terms with our bad decisions. We added up all the debt we had, and it totaled over $40,000. With the failure of Lauren’s formerly successful direct sales endeavor, we were currently running a $1,000 deficit in our monthly budget and something had to give. We had only one option – Lauren had to get a job outside the home. She went out that day and landed a job as a hostess at an upscale steakhouse. But this meant being away from our son and me five nights a week. It was a decrease in quality of life, but it got us through a rough spot. Fast-forward to January 2008 – working several nights a week had taken its toll on all of us, especially Lauren. She wanted nothing more than to be a full-time mom. We still had all the debt, but we had to find a way to make life work on one income. I had a job opportunity that boosted my salary a bit, but our monthly budget was still short. Lauren figured out that if we cut our grocery budget in half we could make it work. Thus started our introduction to the world of coupons which is why she wrote the book How to Coupon Effectively. Again – we couldn’t make much progress on debts; we had decided the benefit of having Lauren at home with our two-year-old son was worth it. 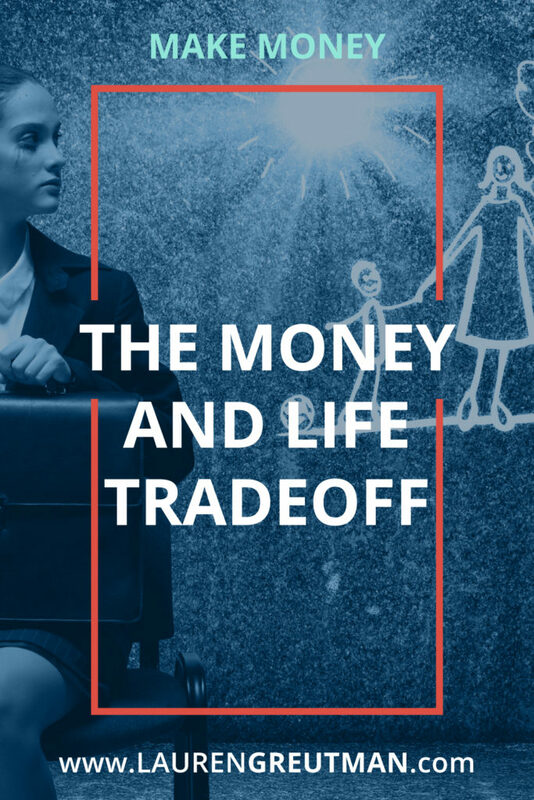 Like you, there are more examples of these significant life/finance choices that we make. Here at LaurenGreutman.com, we try to help you make them in a rational way and attach a dollar amount to them. But only you can decide the value of the social/family/relational impact on your life… the “living” part of your life. I would love to chat more about this – what decisions have you made to LIVE? I recently became a stay at home mom. My husband and I thought long and hard about it, up until the day I resigned I was even going back and forth. It came down to quality of life. In my case, I didn’t love my job, make a TON of money or see much growth potential with that company. So what was I working for, versus what I would be giving up? We talked in great detail what life would be like with the 2 of us working full time and having to take care of the house – we talked through the cleaning, cooking, errands, day care pick ups, etc and knew with 2 busy schedules my husband and I would constantly be battling how to divvy everything up in our very limited free time. We made some shifts in our finances to be better prepared for the big change, and just have to work smarter instead of harder now. It’s been great so far! I end up saving more being at home – not needing work clothes, cooking every day, not using as much gas commuting, etc. I appreciate the article about a work/life balance and the hardship of making this decision. I really wanted to be home with my kiddos, but still wanted to be able to earn some extra money. when my oldest was 9 months, I started watching a friend’s baby part time. Eventually I became a licensed daycare provider caring for several children in addition to my two. For our family, it was a great way for me to earn money & still be there for my children. Now that my children are 10 & 12′ I decided to close the home daycare & go to work in the local school system. That way I get all the same days off they do. It may not be as lucrative as a 40+ hour a week job, but the schedule works perfectly for us.